Cataluña is one of Spain’s 17 Comunidades Autónomas, or “autonomous communities” is located in the northeast corner of Spain, with miles of coastline on the Mediterranean Sea. It is also known as Catalonia. To the west lies the region of Aragon and to the south, the Community of Valencia. Cataluña, like other regions of Spain is made up of several provinces - Girona, Barcelona, Lleida and Tarragona. Cataluña has some of the most sophisticated regional Spanish cuisine, perhaps because of its location bordering France, as well as its Mediterranean coastline. Its location has helped bring many cultural influences from Romans and Arabs in ancient times, as well as from French and Italians in more recent times. Its people are fiercely independent and have their own regional language, Catalan. This is a sauce made from a mix of sautéed tomatoes, peppers and eggplants, also called aubergines. It is used in many different dishes, such as with codfish–Bacalao con Samfaina. Samfaina is a traditional Catalan sauce. Sofrito is a basic Spanish tomato sauce containing tomatoes, garlic and onions, as well as green peppers. These ingredients are sautéed in olive oil to make a mellow tomato sauce that is used as an ingredient in many dishes and can be served as a side dish with eggs or rice. It is served all over Spain and did not originate in Cataluña, but is eaten there. This is a very traditional Catalan sauce made from garlic, parsley, roasted almonds and pine nuts. It is used as a base for other sauces for both fish and meat. Alioli is a simple sauce made from olive oil, egg yolks and lots of garlic! If you’ve ever made home-made mayonnaise, it might look familiar… because it is creamy mayonnaise with plenty of garlic added! One dish that is very traditional in Cataluña and is popular in Valencia as well. Pan con Tomate is Tomato Bread. So simple, yet so delicious… Make it by cutting a fresh tomato in half and rubbing it on a slice of baguette, then drizzling olive oil on the top and finishing with a touch of salt. Eat it plain or top it with a slice of jamón Serrano or a piece of cheese or chorizo. Many prepare Pan con Tomate for breakfast. Another traditional Catalan dish, which is well known is escalivada, a side dish typically eaten in warm summer months, which is made of roasted vegetables with olive oil. Girona has coastline on the Mediterranean, but also includes the Pyrenees mountains. In the mountain area, poultry dishes are the most important and where you find turkeys, geese, ducks and poulards. This area is famous for Christmas Turkey, prepared with stuffing made of sausage, raisins and pine nuts. Game is also popular and there are many traditional dishes made with rabbit, hare and partridges. This is also the area where you will find dishes that mix flavors of the “sea and mountain,” mar i muntanya in Catalan. These dishes mix chicken, game or beef with fish or seafood. Barcelona is the capital city of Cataluña, as well as the name of the province. Barcelona has been well known for its cuisine for centuries. In fact, in the 19th century, its restaurants were said to be some of the best in Europe. The Catalan version of cocido or stew and is considered to be the quintessential Catalan dish and contains a very long list of ingredients from several kinds of beans, sausage, several meats, as well as vegetables. The escudella i carn d’olla has two courses, like the cocido madrileno. The first is a thin noodle and rice soup and the second is meat and vegetables. Noodles in a stoneware pot, served with items such as pork ribs, sausages, ham and sofrito. This dish is made with habas or broad beans, which are very popular in the region are prepared with herbs and spices, mint and butifarra sausage. Cuisine from this area is earthy food from the mountains that includes meat, game and trout as main ingredients. Cassolada is a combination of potatoes, vegetables, bacon fat and ribs. Another dish is girella, with lamb’s hooves with turnips. Like the rest of Cataluña, rice is common in Lleida. This area has a variety of dishes that are delicious, including rabbit with garlic, fish and potatoes and cod fritters. However, rice dishes served with a sauce. The most famous rice dish is arroz abanda, rice and several kinds of fish, served with alioli and romesco sauces. 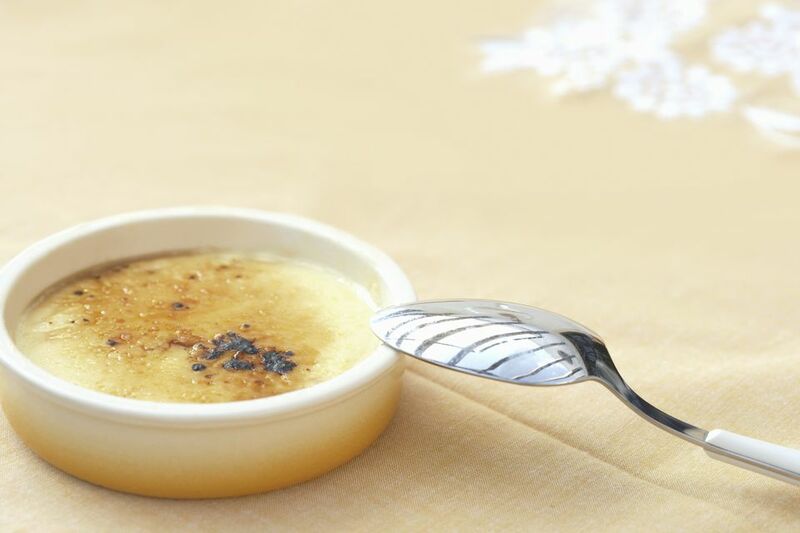 Desserts in Cataluña include Crema Catalana and natillas, a custard. There are a variety of traditional cakes that are prepared, like so many other sweets, coinciding with religious feast days, such as pa de pessic, coques, for St. John’s Eve and panellets, eaten for All Saint's Day in November. Priorato wines come from Tarragona and are of excellent quality. In addition, Spain’s popular sparkling wine, called cava is produced in Sant Sadurní d’Anoia, near the city of Barcelona. If you will be visiting Cataluña, it is important to remember that Catalan is an official language and street signs, menus and other documents will be printed in Catalan. To help understand menus and restaurant brochures, you may want to print this nifty menu "decoder" that Arthur Frommer's BudgetTravel site has posted, written by Mark de la Vina. It contains general food-related terms as well as names of the popular regional dishes with descriptions in English.